Rogers sent us a quick note to let us know that the BlackBerry Q10 will be available for purchase "in the coming weeks". They will be the first to offer up the Q10 on the 2600 MHz LTE spectrum in Canada. 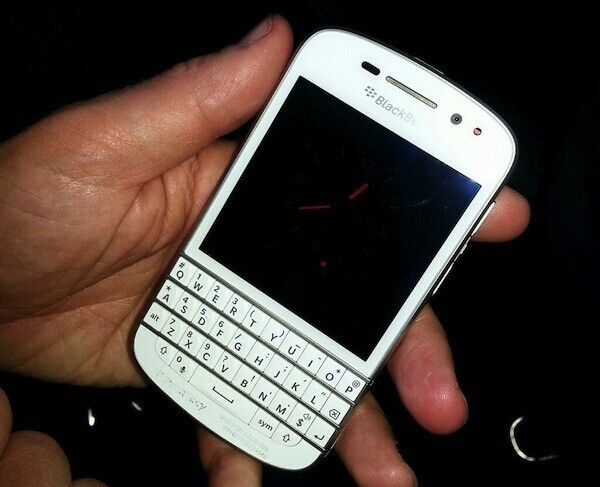 The Q10 will be available in both black and white for $199 on a three-year plan. As we've seen, we expect the Q10 to be officially available for purchase at the end of the month, but you can pre-order now from Rogers and other carriers if you want to stay ahead of the game. TORONTO, April 9, 2013 /CNW/ - Rogers Communications, Canada's leading diversified communications and media company, today announced it will be the first Canadian carrier to offer the new BlackBerry® Q10 smartphone enabled to run on a 2600 MHz LTE spectrum, the fastest wireless internet band available in Canada. The BlackBerry Q10 will be available in both black and white, and Rogers customers will have access first to the white colour model. Powered by the Rogers LTE network, Canada's fastest wireless internet, the BlackBerry Q10 smartphone will enable Canadians to do more with their device such as watch live sports in HD, download large files quickly and stream music at faster speeds. The smartphone's physical QWERTY keyboard and touch screen with the power of the BlackBerry 10 platform will help customers communicate and collaborate faster and more efficiently. "Being a Rogers customer means you have access first to what's next in mobile technology. We're excited to be the first to offer Canadians a choice of the black or limited-time exclusive white BlackBerry Q10, enabled to run on our blazing fast 2600 MHz LTE spectrum," said John Boynton, executive vice president of marketing and chief marketing officer, Rogers Communications. "As we invest in innovative 2600 MHz-enabled devices, Rogers customers will continue to enjoy an enhanced, superior wireless experience versus any other carrier." Rogers announced earlier this month it will expand its LTE 2600 network to 44 new markets this spring. Among these new markets are Saint John, New Brunswick; Medicine Hat, Alberta; Sault Ste. Marie, Ontario; Muskoka, Ontario and Collingwood, Ontario. Rogers has deployed more 2600 MHz spectrum than any other Canadian carrier. Offering a powerful and unique new mobile computing experience, the re-designed, re-engineered and re-invented BlackBerry 10 platform offers customers a faster and smarter experience that continuously adapts to their needs. The ever-present BlackBerry® Hub, which brings all your conversations together in one easy to manage place that you can access at any time from any app with a simple "peek," so you're always only one swipe away from what matters to you. BlackBerry® Balance™ technology, which elegantly separates and secures work applications and data from personal content and lets you instantly switch between your personal and professional profile for easy access to work apps and data. BBM™ (BlackBerry® Messenger), which lets you harness the power of collaboration and exchange ideas in an instant. BBM in BlackBerry 10 includes voice calling and video chat, and lets you share your screen with another BlackBerry 10 contact. The BlackBerry Q10 will be available at Rogers retail and dealer locations across Canada in the coming weeks, starting at $199.99 with select three year plans. Current Rogers wireless customers were among the first to reserve the BlackBerry Q10 smartphone on the Rogers Reservation System earlier this year and pre-orders for new customers are available today at rogers.com. For more information about BlackBerry Q10, visit: www.blackberry.com/BlackBerry10.